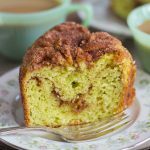 This Coconut Pistachio Bundt Cake is unbelievably moist and tender! You’ll fall in love with this flavor combination. Pistachio and coconut together are indescribably awesome! 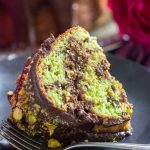 This Coconut Pistachio Bundt Cake is simple to make, but very elegant! I always love the arrival of the weekend (who doesn’t? ), but I’ve been looking forward to this weekend more than usual. I’m telling you, I’m still trying to catch up on sleep and adjust back to east coast time from vacation out west, and we’ve been back for a week now. Everything gets so much harder when you get old! Lol. That’s what I’m blaming this on – age. I can’t wait to sleep in tomorrow and I don’t plan to get out of bed before noon, even if I’m awake! And I can’t wait to just generally relax. It’s going to be fabulous. What are your plans for the weekend and the 4th? Oh, and perhaps more importantly, what about brunch?? This Bacon Spinach & Mushroom Quiche Pie has been going viral lately, so maybe add that to your weekend breakfast plans. 🙂 Along with that suggestion, I recommend these Peanut Butter Chocolate Chip Pancakes… people go nuts over those, or Blueberry Zucchini Bread Pancakes… they’re awesome. 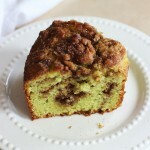 Otherwise, let me introduce you to my latest favorite dessert, this Coconut Pistachio Bundt Cake. Favorite, favorite. 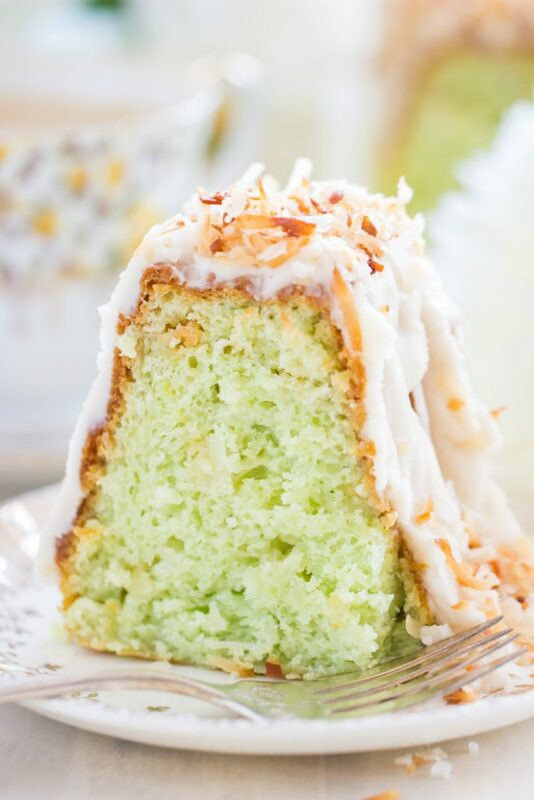 I’m head over heels for this Coconut Pistachio Bundt Cake cake in a way that I haven’t felt in a long time. For a cake, that is. It is even more wonderful than I hoped it would be, and exceeded my expectations on the barometer of deliciousness. 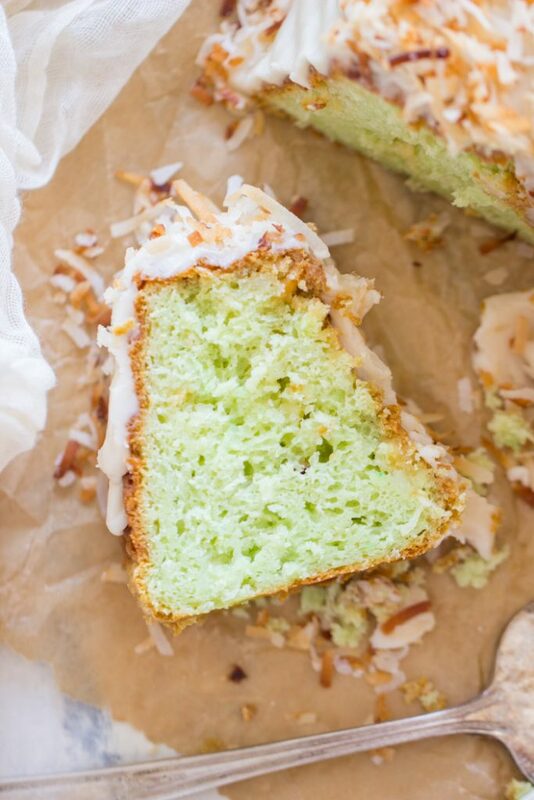 For starters, this Coconut Pistachio Bundt Cake is incredibly tender and moist. There’s something about spiking cake mix with pudding mix, and then doctoring it up a bit with sour cream and oil that lends to a super moist cake. It’s a bit denser than traditional cake, and isn’t as light and airy, and that’s just how a perfect bundt cake should be. 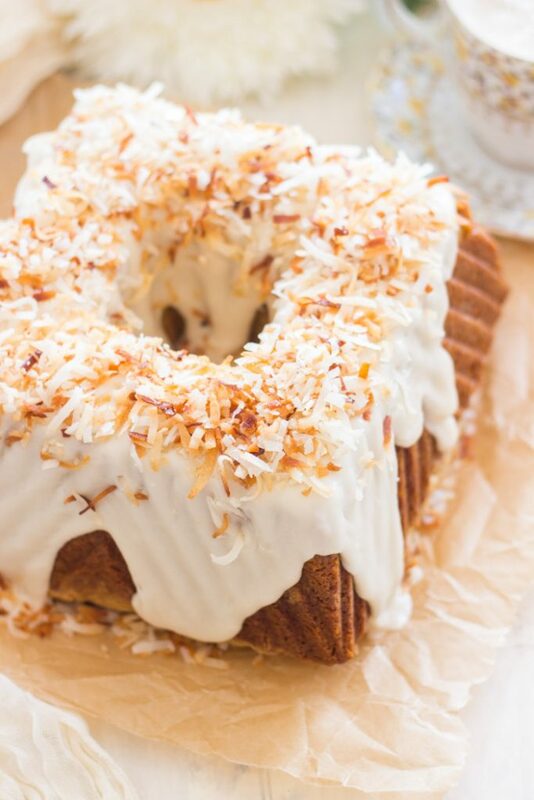 This basic recipe makes a perfect bundt cake, and that’s why I’ve stuck to it for most of my other bundt cakes (see 25 Easy Bundt Cake Recipes). I added white chocolate chips, shredded coconut, and pistachio pudding mix to the cake batter, and those three things contributed fantastic flavor. 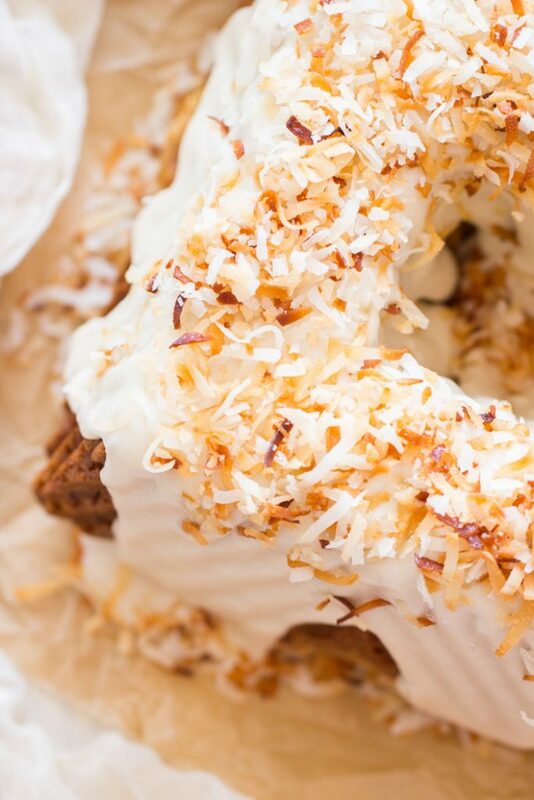 The coconut adds depth to the texture, and it also seems to add extra moisture to baked goods, I’ve noticed. The pistachio pudding mix gives a great boost of pistachio flavor, of course. And white chocolate chips get all melty and gooey inside, and make this cake extra rich and sweet. 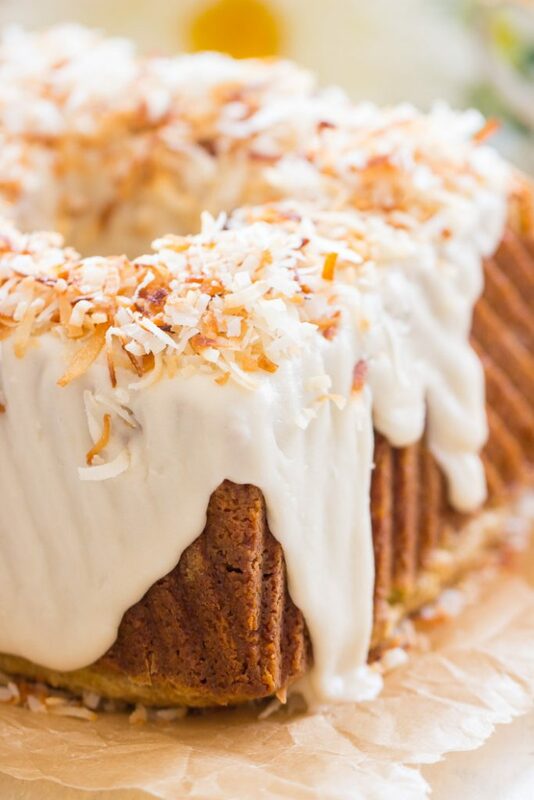 I topped this Coconut Pistachio Bundt Cake with a simple coconut glaze, and a smattering of toasted coconut. 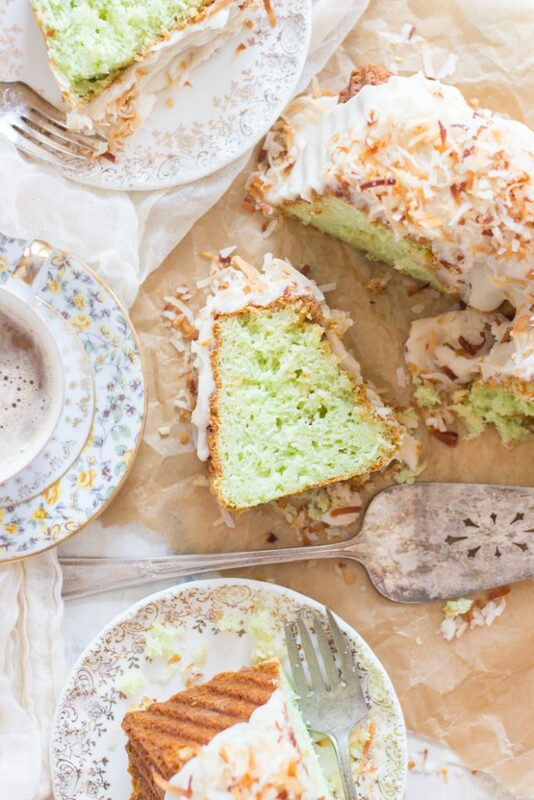 The combo of pistachio and coconut is indescribably wonderful, and this cake is the latest object of my affection. I made it a few times, and froze a lot of individual slices, so I just take them out of the freezer one at a time, and I feel like I can have this cake on demand. You can have this Coconut Pistachio Bundt Cake whenever you want anyway because it’s honestly a very simple recipe to throw together! I could definitely see it being really nice for bridal showers, as a brunch dessert, or next year for Easter or Mother’s Day. If you’re into pistachio things, I have a bunch of other pistachio recipes on the blog, and many of them are actually some of my most popular recipes. Of course, I have to mention my Grandma’s Pistachio Bread. It’s well-loved by readers, and it’s easy and wonderful. These Pistachio Sugar Cookie Bars with Cream Cheese Frosting are also really popular and well-reviewed! One of my personal favorites is this Amaretto Pistachio Cheesecake because those flavors are meant for each other, and are to-die-for in a creamy cheesecake. There’s my short-list of favorite pistachio recipes for you! 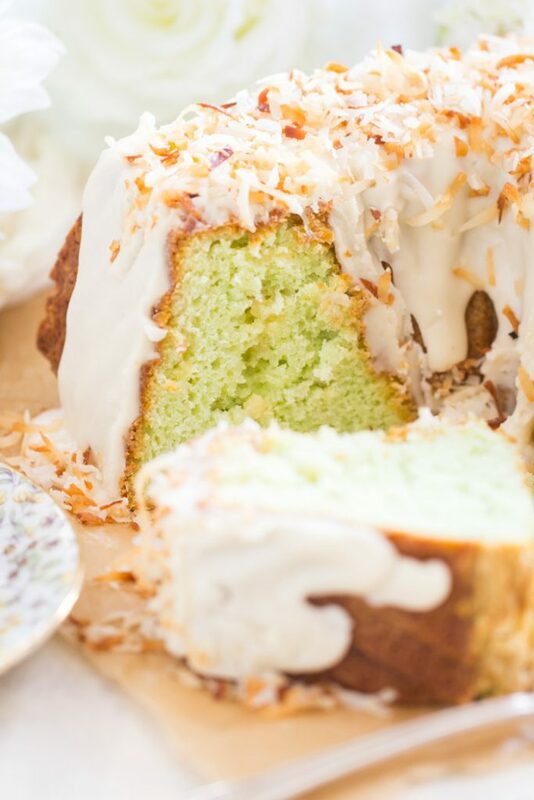 This Coconut Pistachio Bundt Cake is unbelievably moist and tender! You'll fall in love with this flavor combination. Pistachio and coconut together are indescribably awesome! 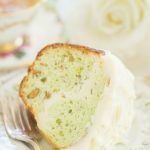 This Coconut Pistachio Bundt Cake is simple to make, but very elegant! Fold in white chocolate chips and coconut. Spread batter into a greased bundt cake pan. Bake at 350 degrees for 40-45 minutes, or until edges are golden, and a toothpick inserted near the center comes out clean. Cool for 10-15 minutes before inverting onto a serving platter. Do not cool completely in pan - cake will stick. In a medium bowl, whisk together butter, coconut extract, vanilla, milk, and 2 cups powdered sugar, adding more powdered sugar as needed to achieve desired consistency. 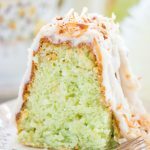 If you like this Coconut Pistachio Bundt Cake, I have a bunch more simple and amazingly delicious cake mix bundt cake recipes. One of the most popular is the Lemon Blueberry Bundt Cake with Lemon Glaze. That thing is ultra-popular and gets wonderful reviews. It is so moist, and the lemon flavor is so vibrant! Other fave cake mix bundt cakes that include chocolate would be this German Chocolate Bundt Cake, this Oreo Bundt Cake, and this Cherry Amaretto Bundt Cake. YAAAY!!! I’m so happy that you’re happy!!! I didn’t realize that all pistachio recipes lately are ice cream! Mine are all basically with pistachio pudding mix though. Lol. Hope that’s not an issue. If you search the site, I also have Pistachio Sugar Cookie Bars and Pistachio Cheesecake. Let me know if you try the bundt. It is freakin’ fabulous! 🙂 Have a great weekend, Dee! I made this cake yesterday. I love the flavor combination! I think next time I would like to add more oil. It was moist, but kind of ‘gummy’ in texture. I think oil would give it the moist texture I’m used to in other bundt cakes I have made. fabulous recipe! Thank You! I’m so glad you liked it! Thank you so much for sharing your feedback. 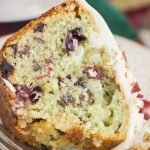 It’s one of my favorite cakes – love the flavor combo too!! Thanks again for your tips and suggestions!